Temporary hoardings are a kind of high security fence or structure that is able to enclose a demolition site or building site during construction works. It is made of corrugated steel, which will fit into the frame that made of heavy duty steel. If you need a separated space for your work or keep the public out, the temporary hoardings will be a good choice. Temporary hoarding is an opaque barrier that can be installed with temporary fence gate, as well as other temporary fencing products. The temporary hoardings can be used for a short term or long term construction projects owing to its features. ?Temporary hoarding has good corrosion resistance with high level galvanizing 300 g/m2. ?Difficult to break and climb over. Its solid panel design stops people from looking into your sites. ?Stable and good aging resistance, sunshine resistance, weather resistance and UV resistance. ?Be quickly erected and dismantled without digging in one site. ?Easy to packing and easy to transport. ?The appearance of the hoarding is attractive and easy to clean. ?The hoarding panel is reusable and eco-friendly. 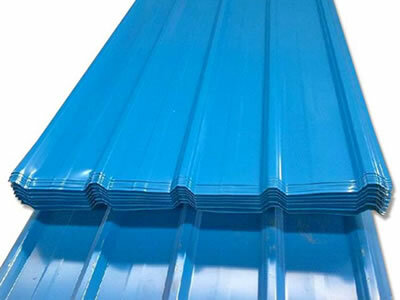 Many blue temporary hoardings sheets with U-profile. TH-1: Temporary hoarding is made of corrugated steel, so the hoardings has good strength. A red and a white corrugated sheet make up a hoarding panel. TH-2: The temporary hoarding sheets coated with two colors are also available. ?Materials: galvanized steel and frame pipe. ?Thickness of zinc: 14 microns, 28 microns or 42 microns as your request. ?Base: concrete, rubber base or steel base. ?Colors: PVC coating is available in different colors, such as blue, red, white, gray and so on. Two colors together are also available. ?Panel height: 1800 mm to 2400 mm. ?Panel length: 2000 mm to 2400 mm. ?Sheet thickness: 0.4 mm to 0.7 mm. ?U-profile: 50-30-50 mm, 50-40-50 mm, 60-40-60 mm. Temporary hoardings with good stability, high strength and attractive appearance can be widely used in construction sites, residential areas and public events as a barrier. It can be used in any site that need a temporary or permanent partition. What's more, the temporary hoardings can also serve as advertisement licensing. The corner of temporary hoardings in a constructions site. The hoardings are installed with plastic feet. TH-3: Temporary hoardings can serve as the safety barrier for construction sites. Steel temporary hoardings are installed with the bracing to improve its stability. TH-4: Temporary hoarding that is supported with bracing will be more stable. For some sites, the temporary hoardings can be installed with the hoarding gates to create an access to temporary restricted areas. ?Height: 1800 mm to 2400 mm. ?Length: 1100 mm, 1200 mm. ?Color: any one of standard RAL colors. A steel pedestrian hoarding gate with a black rubber wheel and a latch. TH-5: Swing pedestrian hoarding gate with a wheel installed will be convenient and open smoothly. ?Length: 4200 mm, 5400 mm. Vehicle hoarding gate with two black rubber wheels and two latches. TH-6: Vehicle hoarding gate with wheels can be opened smoothly. Car boot sale ad details Temporary Hoardings are Ideal for Construction Site for sale in Wigan. Temporary Hoardings are Ideal for Construction Site available on car boot sale in Wigan. More Other home & garden tools for sale in Wigan and more second hand sale ads for free on 2lazy2boot - Wigan car boot fairs - 42210.